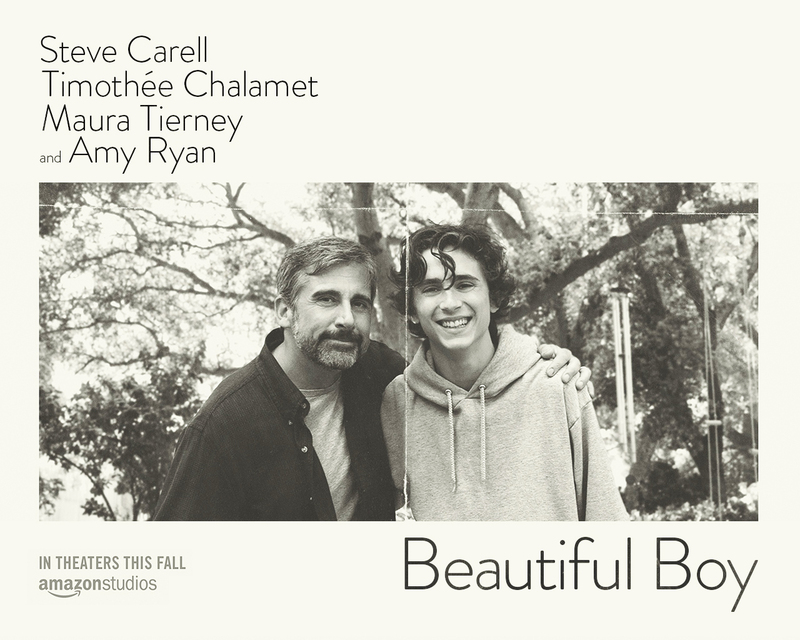 “Beautiful Boy,” starring Steve Carell and Timothee Chalamet, is not an easy watch. The film details the true story of Nic Sheff (Chalamet), a teenager growing up in California who becomes addicted to crystal meth, and how his father David (Carrell) tries to provide support for him. The film opens with David realizing Nic has left home, only to return two days later clearly coming off the high of something — David just does not know what. He takes Nic to rehab, where Nic admits that in addition to experimenting with marijuana and cocaine, he has become addicted to crystal meth. After some time in rehab and a halfway house, Nic is sober again and decides he would like to go to college. This is something David and Nic’s stepmother fully endorse, hoping the independence will help rather than hurt him. For a while, it does. Nic reads, writes and starts a relationship with a girl he meets in one of his classes. But when he goes to his girlfriend’s parents’ house for an introductory dinner, he finds some pills in their bathroom and, much to the chagrin of viewers, takes them. Thus begins a sequence of relapses, sobriety, and one final, miraculously survived overdose. At the core of this bleak and somber film is the overarching theme of familial support. Shown mainly through the view of David, the father, viewers see the effects of Nic’s addiction through his family’s eyes. They struggle with understanding his addiction, the feeling of betrayal when he relapses and at the end, the feeling of relinquishing their control over Nic. In one of the final, heartbreaking scenes, Nic calls his father and asks to come back home — and David says no. At this point, Nic’s addiction has taken over David’s life, permeating his relationship with Nic’s stepmother and children. After this phone call, in a tragic dose of irony, Nic (seemingly purposefully) overdoses in the bathroom of a cafe that he and his father had visited during one of David’s attempts to “fix” his son’s problem. Somehow, he survives and enters another treatment center, which, according to the ending credits, is the one that stuck. The real Nic Sheff, the credits say, has been sober for eight years. No one can argue that “Beautiful Boy” is not powerfully acted. Chalamet has another Oscar nomination-worthy opportunity to use his expressive eyebrows and cry into his father’s arms. Carell, typically known for his comedic chops, gives a wonderful turn as a weary father who wants nothing but the best for his son. To show this, the film uses flashbacks as a way to explore Nic’s adolescence, furthering the close relationship between the father and son and carefully crafting a mutual respect between the two that extends into Nic’s young adulthood. There is no doubt that the film is bleak. This reviewer texted her mother afterwards, promising to never do crystal meth. Despite the film’s distressing subject matter, Carell and Chalamet give stunning performances as father and son who want to do right by each other, but just cannot figure out how.